Posted on July 26, 2018 by dev1305 wrote in General, Trees, Shrubs, and Vines. All right, Floridians, it’s time to get down to business and talk to you about a topic that’s near and dear to all of our hearts. Every week we offer you the best advice that our twenty years of experience can offer, right? Don’t get us wrong, we’re proud to do it and we’re happy to bring you our insight and advice on a myriad of different landscaping options. This article, though, is different, because this article is about one of our Florida staples – Palms. Ah, the Palm. As Floridians, we love the Palm. We see them lining the streets, dotting our beaches, in our neighbor’s yards, in businesses’ landscapes – heck, we see them as soon as we cross the state line into our beloved peninsula. It’s no secret that the Palm is at the center of our Florida-lovin’ hearts. If you think we’re talking crazy, you’re obviously not from around here – but that’s okay! 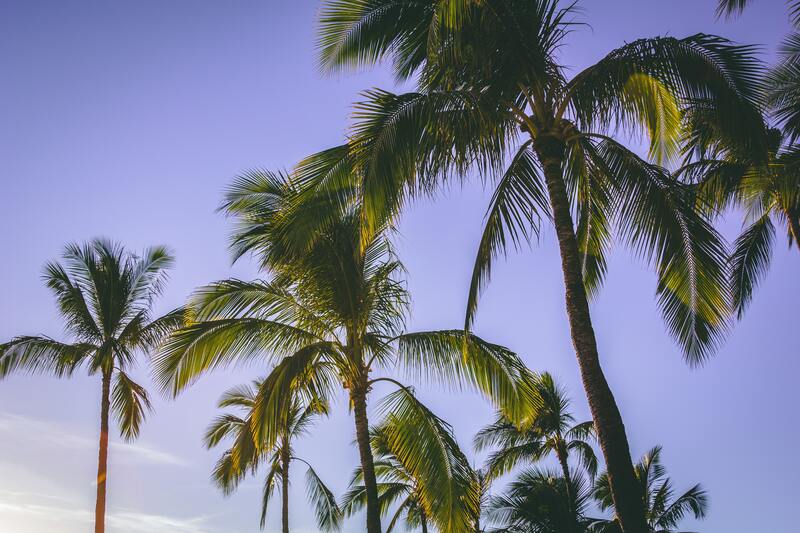 We’re here to share our love of palm trees, talk about Palm care, and, most importantly, break down the top 5 palm trees that we think fit best into your Florida landscape. 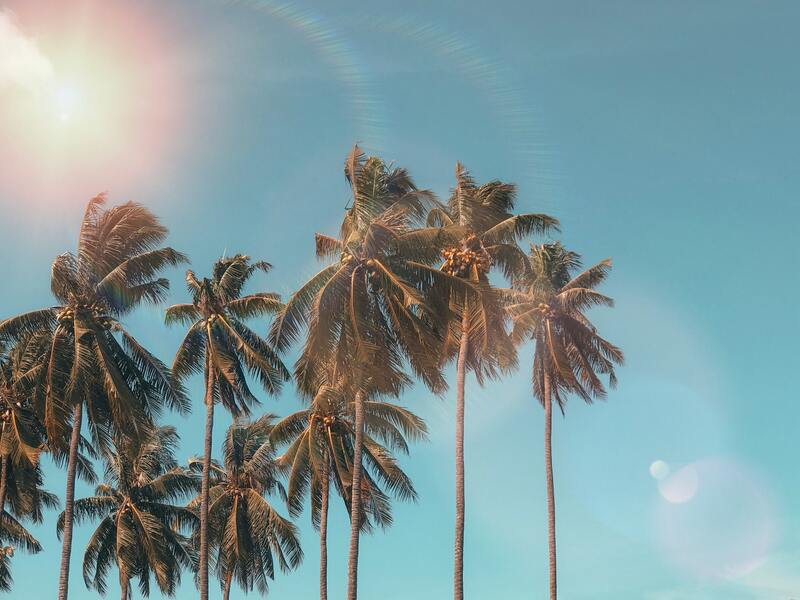 Before we start writing full-blown love songs about palm trees, let’s first dive into why palm trees are a great choice for your Florida landscape. For starters, they sort of just go with that Florida image, right? White sands, blue skies, and of course, palm trees swaying in the wind – you really just can’t go wrong with that visual. Aesthetically, they’re everything a tropical Florida landscape could want. 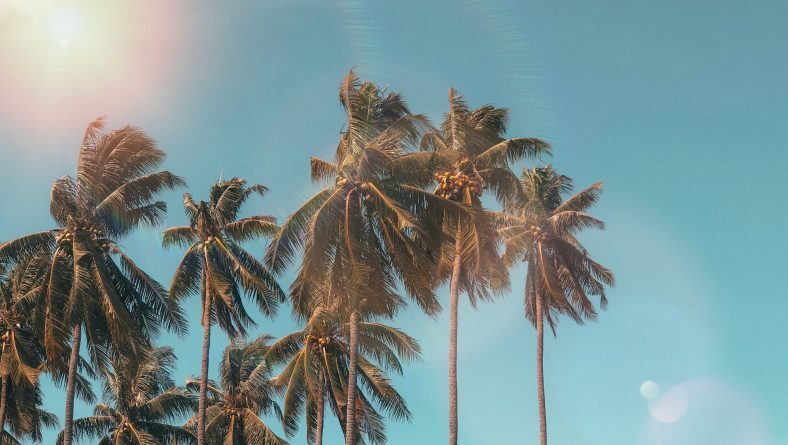 Palm trees look great in botanical gardens, shopping centers, swimming pools, and along the coast – they’re pretty much everywhere, and they look great. Aside from just aesthetics, though, palm trees make a great choice for Florida climate. As you obviously know, Florida has a hot, humid, tropical client – and it takes a special kind of tree to thrive here. 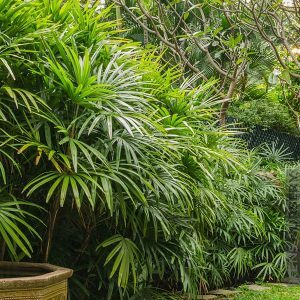 There are dozens – no, hundreds of Palms that could fit best with your Florida landscape, but we’ve narrowed it down to just a handful of some of our favorites. Whether you’re looking for the ultimate poolside Palm, or simply want one that can survive in full sun, we’ve got a few of the best options available for you. Keep in mind that when it comes to Palms, your options are not limited. There are so many different palms out there it’ll make your head spin! Don’t be afraid to give us a call and chat with us about all of your options! This is one of the most well-known palms on the planet. It’s a popular choice in Florida and it’s probably the first palm your mind conjures up when you consider Florida flora and fauna. 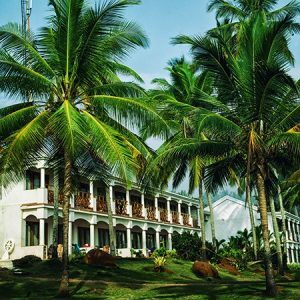 The Coconut Palm Tree can grow up to 98 feet tall, has wispy leaves, and grows coconuts (of course). Without question, the Coconut Palm Tree is the quintessential Florida palm. It doesn’t require shade, it’s practically drought-proof, and is incredibly salt tolerant. These trees will thrive in the hot Florida sun and are great additions to coastal homes that have salty, humid air. Also known as the Lipstick Palm (because of its red crown shaft), this tree is native to Thailand, so it’s used to tropical conditions. This palm is special in appearance, but also special in that it will thrive in shady conditions. 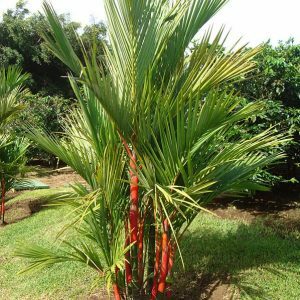 Lots of palm trees require full sun in order to grow their best, but this red palm will thrive when placed in shady spots. 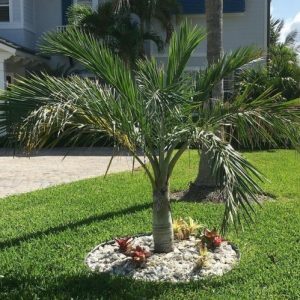 If you have an unusually shady yard but are looking to insert a little Florida into your landscape, this might be the perfect palm for you! It adds a pop of color, doesn’t require much maintenance, and can grow up to 52 feet tall if properly cared for. In Florida, a poolside palm is a must-have, but with all the factors that you must consider for a palm that’s in your pool landscape, it can be hard to narrow down your options. The Buccaneer Palm is one of the best bets for a poolside palm tree because they’re great all-around palms that don’t require too much extra maintenance. This palm is a slow grower, will thrive in full sun (which is often necessary for poolside plants), is (mostly) drought-tolerant, and can provide you with shade if the palm leaves grow full enough. This palm will typically grow to about 15 feet, but needs patience (as we said before, it’s a slow grower). If you’re looking to put up a palm by the pool that doesn’t require much extra attention, this durable and versatile palm is one of the best options to consider. 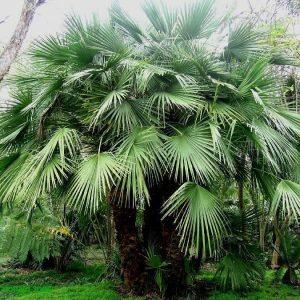 If you’re looking for something small in stature that leaves a big impression, then the European Fan Palm could be just the tree you’re searching for. It’s tiny, somewhat furry, little tree with pomade-style leaves that fan out. They often range from green to silver, making the tree appear to change hues as the leaves grow out. It’s a versatile choice, brings lots of color and texture to your lawn, and won’t grow more than 15 feet at most. They’re low maintenance, bring the tropical look to your lawn you’re craving, and are notably one of the easiest plans to own. Though it’s not scientifically known as the Aristocratic Lady Palm Tree (its actual name in Latin is Rhapis Excelsa), it certainly makes sense to call it that. For one, this is a lovely looking, dignified Palm, but it’s also an incredibly hardy, durable tree, too. This palm will live and thrive in both low-light and bright filtered light, making it ideal for both outdoor and indoor living! Lady palms are incredibly versatile when it comes to soil, climate, and environment. It’s also incredibly easy to care for. It’s a full, lush, palm that grows up to 6 feet, shoots out stems and canes of about 1 inch wide, and can flower with light green, yellow, and pink blooms. These are popular palm shrubs, but they can grow into larger, fuller palm trees, too. They’re a great pick for Florida because they can handle the one-off surprise freeze and will continue thrive in degrees as low as 15 F.
If you’re not palm tree crazy by now, we obviously haven’t done our job correctly. (Just kidding, we understand that every plant, tree, and shrub needs love, so if Palms still aren’t your favorite, check out some other Florida-friendly plants). If you want to know more about palms, want to chat about your specific landscape, or want to work on a free quote together, give our office a call at (727)-201-3947. Want some other palm-inspired inspo? Want to get the insider tips and tricks about Florida landscaping in general? Check out our regularly-updated blog here!